Attendees can be prompted to provide their consent to be recorded in a meeting or a webinar. 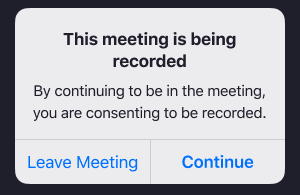 If this setting is enabled attendees will receive a notification when a recording starts or if they join a session that is already being recorded. The attendee can either consent to stay in the session or leave. After the session a report listing the attendees who provided consent can be generated. Login to your account on Zoom.us. Click Meeting Settings and go to the Recording tab. Toggle the Recording reminder option to on (blue). You can also also enable or disable this feature for other users on your account via Account Settings or Group Management. 1. The following message will appear when joining a session that is being recorded or if a recording is started during a session. 2. Click Continue to consent to be recorded. Click Leave Meeting to opt out and exit the session. 2. Tap Continue to consent to be recorded. Tap Leave Meeting to opt out and exit the session. Click the Usage or Active Host report. This will vary based on your account access. Once you input criteria to generate a meeting list, click the number in the participants column to generate a detailed report.You will see a section for recording consent in the window that is displayed.